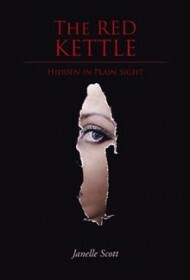 Janelle Scott offers a figurative and literal blow-by-blow description of marital abuse in her novel The Red Kettle. The book starts out with a full head of steam that quickly dissipates but gains traction anew as the story unfolds. Caroline, the main character, has left her abusive husband Owen, who has set all of her worldly possessions on fire in front of their home. The police arrest Owen, but Caroline’s unknown whereabouts hint at an even darker scenario. The plot then veers back to an undefined earlier time, delving into “average” (as the author describes her) Caroline’s family background. This includes her “neither fat nor thin” mother and a father “who would [not] stand out in a crowd, even if there were only ten people [in] that crowd….” Caroline, the author tells us, has followed in her parents’ footsteps. The slow start continues throughout the early chapters as Scott details the rise and deterioration of Caroline and Owen’s relationship. She portrays her characters consistently, delving into every nuance of their lives. But judicious editing is in order. Rather than recounting all of Owen’s misdeeds, selection of a few telling anecdotes, such as when Owen sells Caroline’s beloved car “Betty” without her permission, would add suspense and sharpen the underlying sense of dread. It would also allow for quicker emergence of the book’s strongest portion, which occurs on page 65 with the introduction of Margie, the coffee shop owner who helps Caroline achieve financial and emotional independence and Margie’s coworkers and friends, Amanda and Lindy. The intricacy of these women’s lives and how they interrelate make for engaging reading. Phrases such as “Caroline’s confidence had soared under Margie’s gentle umbrella of love” portray the heart of the story, which works best when depicting empowerment and healing. While tales of abuse are common, successful ways to overcome it can offer inspiration and hope. It is here where The Red Kettle provides a cup of comfort.